While Chipotle’s mindful approach to fast food revolutionized the industry and ushered in an entire new category, and era, of fast casual chain dining in America, the unfortunate truth is that this brand name is now synonymous with a disastrous multistate E. coli outbreak that hospitalized 21. Chipotle sales plunged 30 percent in December 2015 and, even now, JP Morgan analysts say the company will have lost three years of earnings between fiscal years 2014 and 2017. This amid the CDC's official conclusion was that the outbreak source was “unknown” as well as the chain’s reported belief that it likely stemmed from contaminated beef that spread to other foodstuffs through improper food handling. The truth is, a bacterium-born illness like this can happen at any business at any time, especially if appropriate precautions are not in place to vastly mitigate the risk. 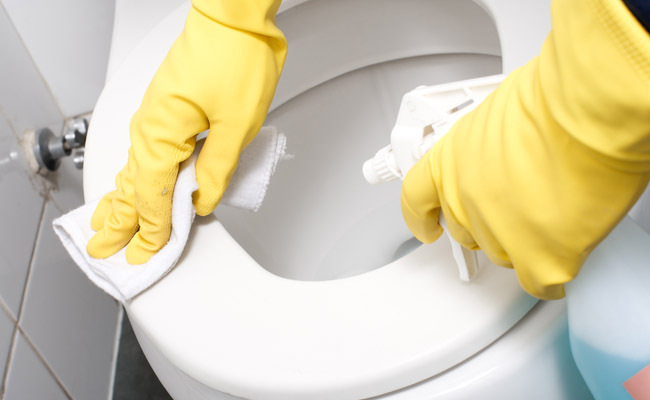 Whether you're operating a restaurant, retail store, business office, or any other facility where clients, customers, business associates and even resident employees can use restroom facilities, how well your company handles cleanliness and hygiene of the lavatories can make or break your bottom line—both immediately with the abrupt fallout, and longer term due to permanent tarnish of the brand reputation that will assuredly suffer to some degree. Indeed, in today’s rapid fire Internet culture where even one slight mishap or moment of carelessness can go global in minutes, coupled with the litigious nature of modern society in general, doing your utmost to ensure the health and well-being of any person visiting or working at your business site is not discretionary—it’s mission critical. With this in mind, here are 3 easy ways to develop a healthier and safer workplace—one with less bacteria, viruses, parasites, fungi and other such pathogens. Also one leaving customers with a better brand experience and, in turn, avoiding fiscal catastrophe. Being vigilant about cleanliness must be a business mandate from the top, down. As a business owner, executive or manager, you need to ensure employees are not only aware of proper hygiene procedures, but also the importance of steadfastly sticking to stated protocols. These include proper hand washing techniques, of course. According to the Centers for Disease Control, hand washing education can reduce respiratory illnesses such as colds in a community by up to 21 percent. Unfortunately, many people aren't aware of the proper way to wash their hands. The CDC recommends wetting your hands, lathering up with soap and scrubbing for 20 seconds. Make sure to scrub the backs of your hands, under your nails and between your fingers. Additionally, antibacterial products should be used to clean the aforementioned surfaces as a routine part of any employee’s activities at the end of each shift. While many places of business have a sign that reminds employees to wash their hands before returning to work, too many businesses do not have ongoing conversations about this requirement and make hygiene and cleanliness a principle value of the culture. Many businesses also don’t think about common hotspots that are ground zero for cross contamination, can occur when multiple people touch the same things like keyboards, printers, door knobs, refrigerator doors, cash registers, credit card terminals and microwave ovens. While these are commonplace challenges for any business, certain industries have their own specific set of challenges. For example, many restaurants do initial training on kitchen behavior but do not do strict monitoring in an ongoing capacity. So, for a business category like this, provisions and mandates like gloves, hairnets and not wiping hands on shirts are paramount to avoid any form of contamination. With the amount of new technologies to deploy today, having traditional toilets, faucets and paper towel dispensers doesn’t only risk cross contamination—it also makes your business look dated! With the advent of touch-free technologies, for example, that allow patrons to use sinks, soap, towels and air dryers without coming into contact with any surface, the chances of picking up germs is vastly minimized if not entirely eliminated with respect to these particular devices. Indeed, the fewer surfaces a person touches in a bathroom, the better. Touch-free advancements inherently render restrooms far cleaner than they would be otherwise, and also provide a great offensive strategy to make a business look more modern, provide a better customer experience and, in turn, receive favorable reviews. And, the power of sanitary bathroom appearance cannot be underestimated. As one example, last year, a high profile media outlet covered a Shell gas station bathroom in the Philippines that it asserted as being ”nicer than your apartment.” The YouTube video of a patron showing off this particular bathroom received hundreds of thousands of views. QuickTrip gas stations also decided to make bathroom cleanliness a priority and, along with the business being named by Forbes as one of ”America’s Best Employers”; the cleanliness-minded operation is realizing performance benefits for their attention to detail. “Tough it out” is the unfortunate sort-sighted culture of many businesses that often encourages employees to come to work sick. Running a business with ill staffers usually leads to decreased productivity and increased chances of infecting fellow employees and customers. Additionally, stress has been scientifically linked to everything from stomach problems to depression. As an employer, you can take steps to create a more relaxed environment in order to relieve employee stress and maintain good health. Encourage employees not to skip breaks and, if possible, provide a break room with something fun in it such as golf nets. Also, the less stressed and frantic and employee, the more likely they are to actually follow hygiene and cleaning procedures rather than senselessly rushing out of the bathroom. Remember, it only takes one careless person to make a lot of people sick, or worse. As recently as March 2016, the CDC was investigating a bacterial infection that killed 18 in Wisconsin. Business cultures that maintain this kind of “tough it out” culture are being reckless and could be inadvertently putting a potential crisis in motion. As Rob Weinhold, author of “ The Art of Crisis Leadership: Save Time, Money, Customers, and Ultimately Your Career ” puts it: “It is a leader’s job to try to anticipate crisis and the leader’s that develop and act on that foresight have a competitive advantage in the marketplace.” Moreover, as Vince Lombardi famously said, “life is a game of inches.” So is business. Not only with respect to growth relative to business development, but also other facets of an operation that can be the determining factor whether or not businesses retain a customer, garner a positive review or enjoy favorable word of mouth referrals. In the age of social media the last thing any business needs is for someone to take a damaging picture and post it to social media—an image and related commentary that can readily go viral, resulting in significant adverse repercussions on a business’s bottom line. Brian Greenberg is a multi-faceted entrepreneur who has founded and now spearheads multiple online businesses. He currently co-owns and operates three entrepreneurial companies with his father, Elliott Greenberg, which have each flourished for over 10 years: www.wholesalejanitorialsupply.com , www.TouchFreeConcepts.com and www.TrueBlueLifeInsurance.com.